Welcome to Dog Artists and our Westie Portraits page! 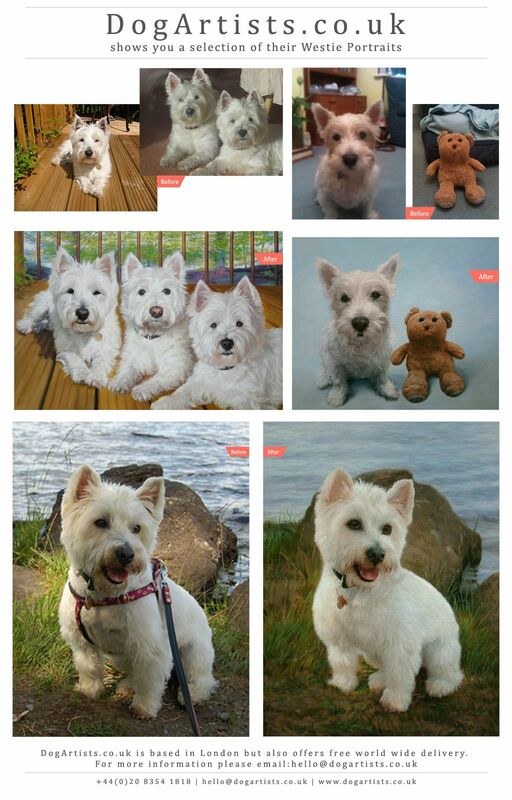 Here is a small selection of our Westie Portraits, all of which were based on photos that their owners emailed to us. 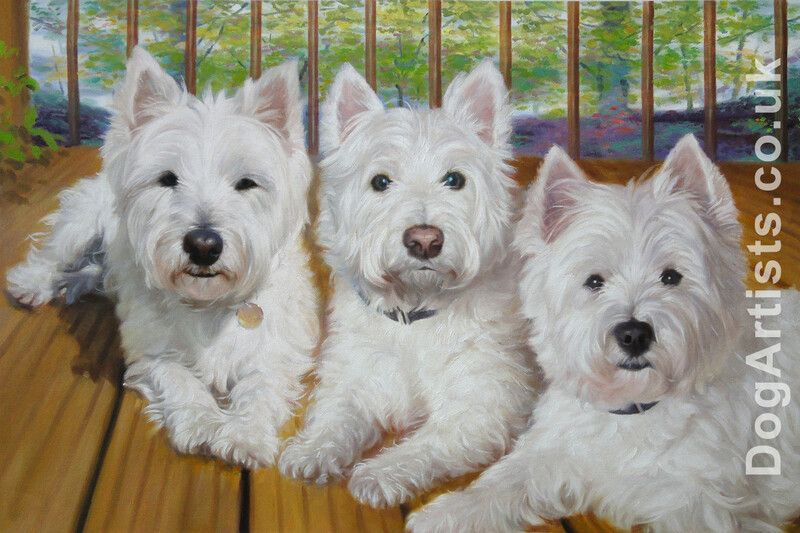 The variety on show here gives you a good idea of the types of styles you could have your Westie painted in. All of these Westie Portraits are hand-painted using premium Winsor & Newton oils onto a high quality duck cotton canvas. Oils do take a while to dry and as we pride ourselves on painting you high quality Westie portraits that you will be proud to display and that will stand the test of time we will not rush on the quality of your portrait. We therefore ask that you allow between 4 – 6 weeks from commissioning your portrait to receiving it. If you are ordering a dog portrait as a gift for a special occasion and are on a tight timeframe we can send you or your recipient personalised gift vouchers. Would you like a quote for one of our dog artists to hand paint you a beautiful oil painting of your West Highland White Terrier? If you could let us know the size you were thinking of and any ideas you may have for the style of portrait, we’ll get back to you within 24 hours. Please allow 4 weeks for your dog artist to complete your Westie painting, once finished we will email you a high-resolution photo of your Westie painting and should you wish your dog artist to make any changes, your artist will be happy to do so! Once the oils have dried we will then deliver your beautiful Westie portrait to you. Amanda English shows off our oil painting of her dog in Dogs Monthly Magazine. Order a Beautiful Westie Oil Portrait Now!